Definition - What does Monkey Pose mean? Monkey pose is an advanced seated posture that increases flexibility in the hips, groin and legs -- particularly the hamstrings and quadriceps. 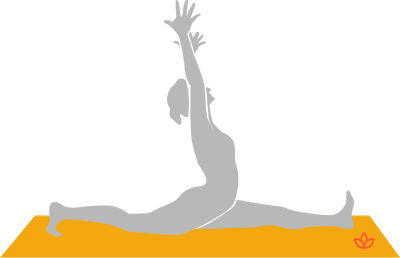 In the fullest expression of this pose, the legs are in a front split position. One leg extends in front of the torso and the other extends behind the torso. The hand and arm positions can vary, but they are typically placed in prayer position (anjali mudra) or stretched upward to the sky. Monkey pose may also be referred to by its Sanskrit name, Hanumanasana, which is derived from the name of the Hindu monkey god, Hanuman. Monkey pose is a difficult posture that requires proper warm-up and preparatory poses. Postures that would be beneficial in preparation for monkey pose include bound angle pose, reclining bound angle pose, seated forward pose, head-to-knee forward bend, wide-legged standing forward bend and reclining hand-to-big-toe pose. Reduction in stress and fatigue. Improvement in overall balance and alignment. Stronger and more flexible leg muscles. Stimulation of the abdominal organs and improved abdominal muscle strength. Improved flexibility of the hip and groin muscles. Beginners, or those with limited flexibility, should place their hands on yoga blocks to support the body and bring the torso more upright. A thick bolster or folded blanket may be placed under the pelvis if the practitioner can't reach the ground. A bolster or blanket under the hamstring of the front leg may also be helpful.